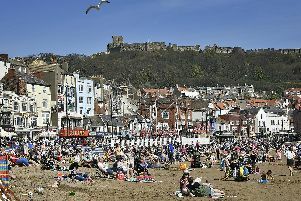 A Filey man has been spared jail after he admitted threatening a Scarborough barman with a rolling pin. Paul Andrew Gale, 34, of Thorn Tree Avenue in Filey, admitted possessing an offensive weapon at the Ivanhoe and using threatening words or behaviour when he appeared at Scarborough Magistrates’ Court on Monday. Gale claimed he had the rolling pin, which he produced from the sleeve of his jumper, with him at the pub on May 27 as he was planning to make a pizza for his dinner. The court was shown CCTV footage from the day in question, which showed Gale producing the rolling pin and then waving it like a weapon in front of the barman. Prosecutor Katy Varlow said the barman was felt threatened during the incident and called the police. After finishing his drink Gale left the Ivanhoe, but later returned to hand the rolling pin to a female barmaid. Mitigating, Caroline Watson said it was a “short-lived incident” and that her client had only gone to the pub as his partner had received unsolicited picture text message from someone Gale believed to work at the Ivanhoe. She added he was “deeply embarrassed” and had apologised for his actions. Gale was given a 12-week prison sentence, suspended for two years. He was given a 12-week curfew and banned from the Ivanhoe for two years. Gale, who is registered carer for his mother and father, will also have to pay £85 costs and a £115 surcharge. The magistrates’ ordered that the rolling pin should be destroyed.